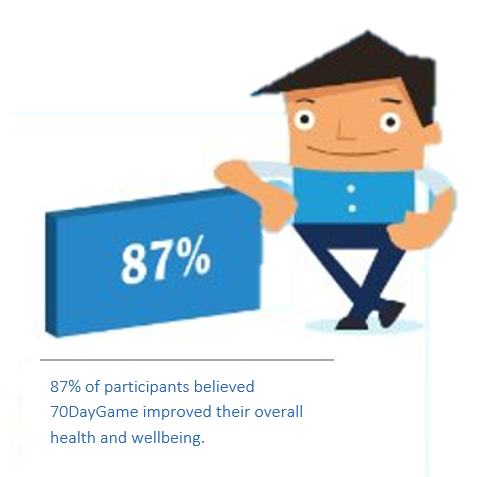 To complement PeopleCentric’s Psychologically Healthy Workplace Program we have partnered with 70DayGame to encourage a holistic approach to employee well-being. 70DayGame is a fun and interactive online wellness program to encourage your organisation or team to build healthy habits. The 70DayGame offers challenges for all fitness levels and tracks your movements with a 3D movement meter. While tracking your movement each day, you also select 3 weekly challenges out of 150 to enhance your nutrition, fitness and thinking. Teams of up to 4 participate for $80+gst per person. Each participant receives a 3D movement meter, access to iPhone and android apps, support from a wellness professional, and spot prizes from Adidas and Icebreaker. Take the next step to workplace wellness and contact PeopleCentric.